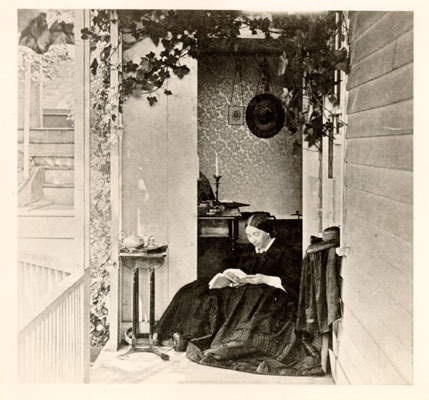 Mrs. General Fremont on porch at Black Point, 1863. 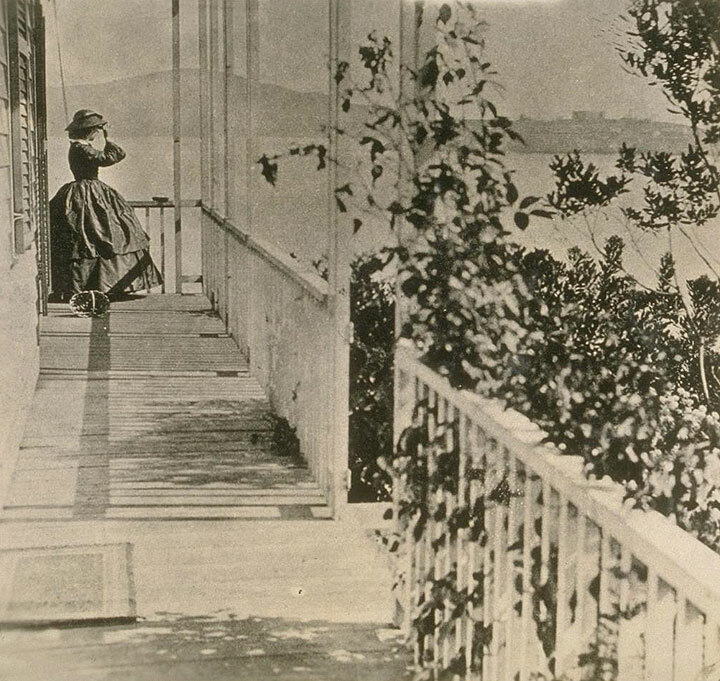 Mrs. General Fremont on her porch at Black Point, c. 1863. 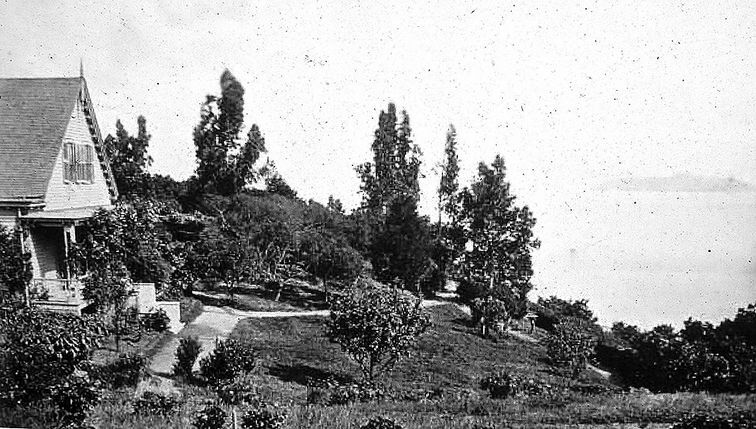 Black Point (now Fort Mason), 1870. Spring Valley Water Co. brought water through the flume that skirts the cliffs. Small farms run down to the shore. Alcatraz is in the distance. 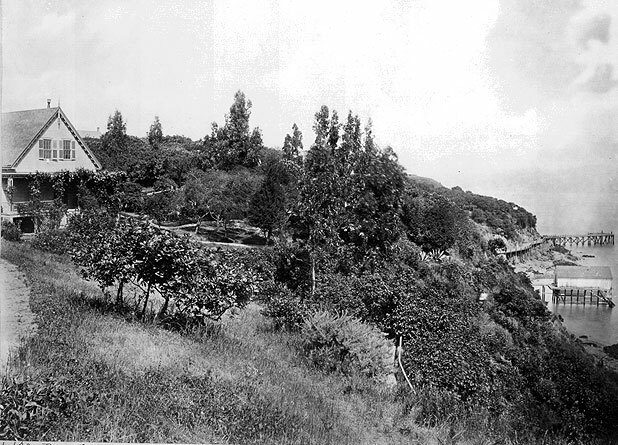 John C. Fremont bought a farm for his wife Jessie on the north edge of San Francisco, on a small rocky peninsula then known as Blackpoint, about 1860. At the time of purchase, they were living in Bear Valley in the Sierras. In Bear Valley Jessie Fremont developed physical problems due to the intense heat. She wrote that a buried egg would cook in just a few minutes. One account states that it was 106 degrees at sunset--not an uncommon temperature that year. So we can probably imagine her delight when John C. came back from a business trip to San Francisco in 1861, and told her they were moving to the city. Blackpoint was a self-sustaining farm, and Jessie's favorite home. She had relatives living with her, as well as visits from other relatives in addition to local and national celebrities. As a matter of fact, a influential San Franciscan, I.W. Raymond, visited the Fremonts in Bear Valley and traveled with them to see the place that wasn't yet named Yosemite. He was a key person in the 1864 action of President Lincoln which made Yosemite a protected place. Black Point is described in "Jesse Fremont: A woman who made history" as "a small headland jutting out into the channel entrance of the harbor, in fact directly opposite the Golden Gate, affording an unbroken view westward to the Pacific and eastward toward the mountains of Contra Costa." Jessie said she "loved this sea home so much that I had joy even in the tolling of the fogbell". It was here she planned and built her "sunset beach." The federal government took over Black Point soon after Jessie and John Fremont went back east to be involved in the civil war. John fought for compensation for the expropriated house and land until the day he died. 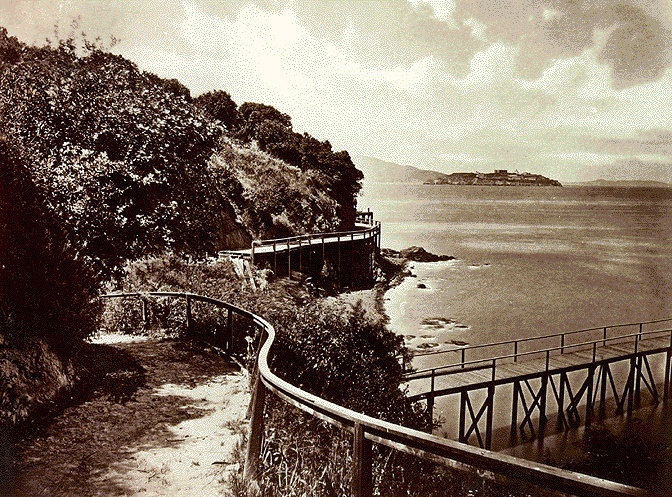 Black Point, 1869, Alcatraz in distance.